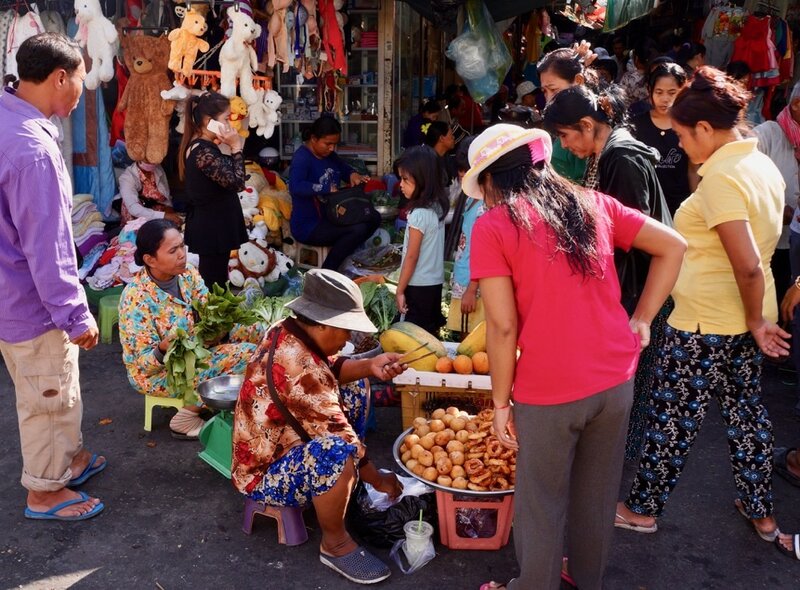 There's an interesting market just a block from where we stay here in Phnom Penh and if I need inspiration I walk there. Some people like the quiet of the country side for inspiration. I go for the noise and chaos of the market. Each time I go there, a type of engaged contentment reigns as I look around. Yesterday, I noted how the in-between steps taken by the vendors add real value to their products and to my daily experience. I began to think how the value they add gives me the comfort and space to do other things. How Did the In-between Step Add Value? I'll start with my purchase of fruits. 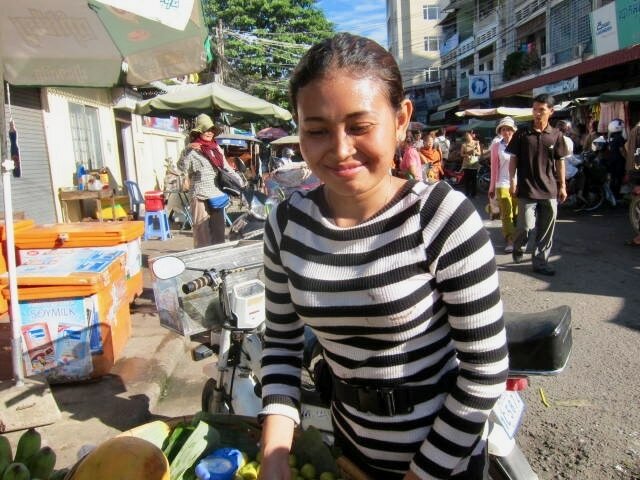 I often go to the same vendor as I have known her to be an honest seller and she has a warm smile. ​I am not the only one who goes back to her mobile stall. In fact, yesterday some of us lined up there in front of her cart waiting for her to come back wherever she was. No one left to get their fruits from the other vendors who really must have wondered why this was happening. Prices are much of a muchness, so they knew it had to be something else. She has a cart right on the road and a portable storage for the fruits. I see she packs it all carefully with newspaper. Every fruit. She seems to know each one of her papayas and when they're going to be ready to eat. I trust her as she has been proven to be consistently right. She even asked me one time if I found my last purchase sweet enough. Every fruit she sells there she chooses individually from the wholesale market or grower and from these you can still choose what you want. As she does not put all of the fruits in the cart, they have not been bruised by other buyers pressing their hands to check if they are ripe. By the way, that's one of the things I dislike, when people press fruits to find out if they’re ripe. They spoil the fruits, that's what they're doing. You can look at it, you can smell it but for heaven's sake don't press it so many times. There you go. The in-between service of choosing well what you sell ensures your customers will come back to you all the time. It really adds value and becomes the timeless base for the small entrepreneur rather than Walmart or whatever. Anyway, my next purchase was fresh mature coconut to use for cooking. I often bought the can or tetrapack of coconut milk but having seen the fresh ones sold in this market, I ventured to find one. I saw in a hidden corner a middle aged woman using the machine to grate the meat from the mature coconut. You can squeeze these freshly grated coconut to get the milk. The taste when you use this for cooking is exquisitely fresh. The can or tetra pack loses hands down in comparison. Of course, having grown up in Asia, I know this well but with my highly sanitized years in North America, first I hesitated, but this time I took courage. I can also cook these grated coconut to get some coconut oil for the health of my hair and skin. But because the lady grated this for me, I found it easy to use for many different things. In the past, people have to grate the coconut themselves and I found that super laborious. So again, that saved me time and gave me a chance to have delicious meals using milk from freshly grated coconut with no empty tetrapack to throw out. With my spirit lifted, I braved the crowded narrow lanes of the local market to find my next favourite: squash. Squash I think is one super food that not many folks use because they are hard to peel and it is really difficult to tell ripeness or old age. Of course, you can just cut it and put it in the microwave or oven but there are other ways of cooking it to whet the appetite of your family. If one of my market sellers can pick a good one for me, I’ll make a real treat. I like squash for the particular reason that it serves as a rice substitute for me who is trying to lose the extra pounds and mange starch consumption.. In this market, they will cut just only the piece you need. You are not stuck with a whole squash which you will force on your family to finish. No problem with language either. Sign language is fine and there are always other vendors and buyers to translate for you. Even payment, I bring my change purse with me and just open it and they get what they want. Trust is the basis of repeat business and a real added value built by the vendor. Before going home, I went to my pineapple lady. She peels the pineapple for me so another added value. 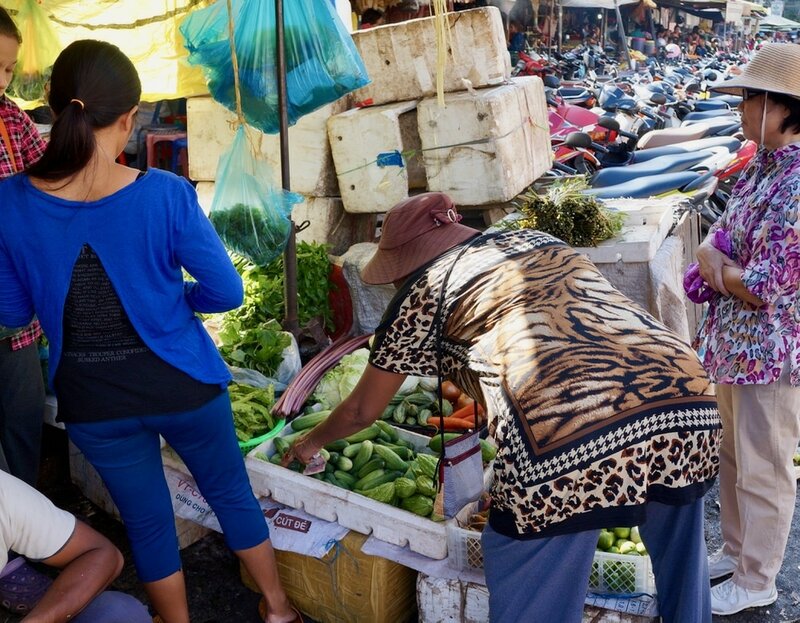 These services are often sometimes done by supermarkets but the problem is the fruits and vegetable have already languished there for several days, not as fresh as these ones from the market. Even the greens, I just get what I want, just enough for a day or two as the market is just a short walk for me. 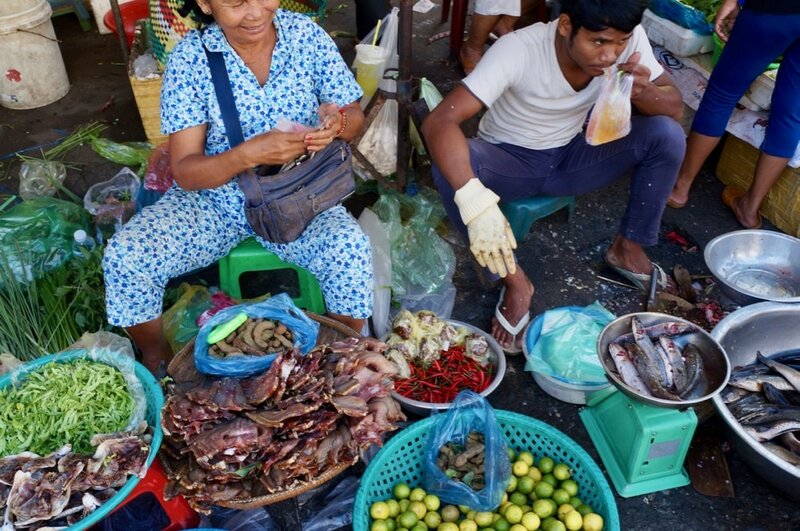 Of course I realize the benefits of modern packaging and refrigeration for Moms with jobs, but the value added by the in-between steps of the local vendor really makes sense if you can make the time. 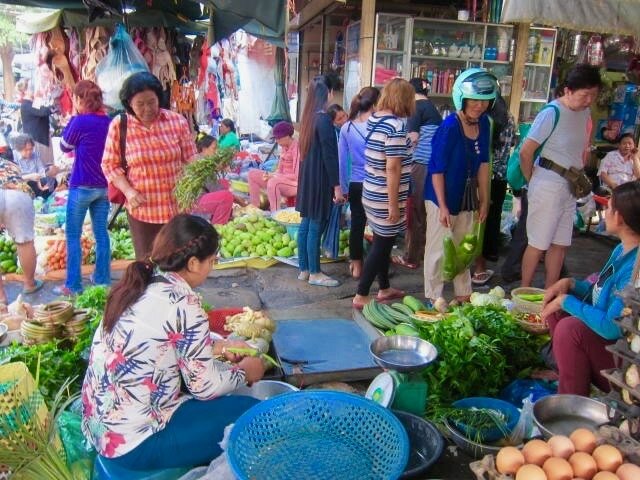 I know that as happened in many other places, in the future, these markets will give way to supermarkets as unlike their parents, many younger ones would rather work in these supermarkets than sell in the market stalls. Younger shoppers also prefer the ease of supermarkets. But what we’ve found in North America is that the loss of the in-between steps leads to the resurgence of Farmers Markets everywhere. 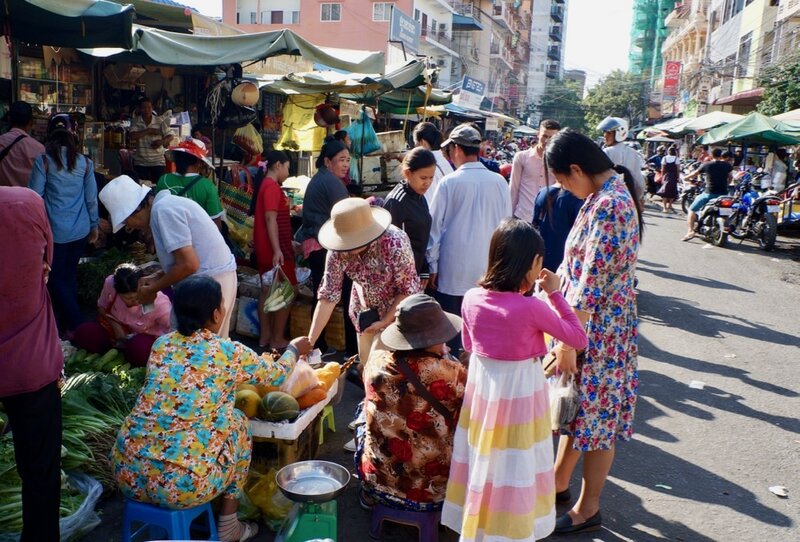 Vendors just like these in Phnom Penh taking a special interest in quality and service to make sure you will come back are the ones who will grow their customer base. All businesses can learn the lessons of the in-between step that builds a very direct trust link with the buyer. There is nothing like adding value to your products with a human touch to make customers come back over and over again. Before you leave, please do't forget to share this and leave your comments below.